The Chinese studio Muxin Design and Research has been asked to redesign an ‘old style’ office so that the environment could be more pleasant for staff. The first step, say the architects, was to eliminate the cubicles to “let the forest in”. Muxin Design and Research is a Chinese architecture and interior design studio. In 2015 it was called on to redesign the structure of an office in Shanghai. Designers Zhang, Sun, Ouyang and Wang describe an office with irregular shapes, with lots of dead, unused corners and cubicles that limited all possibilities of colleagues interacting with each other. 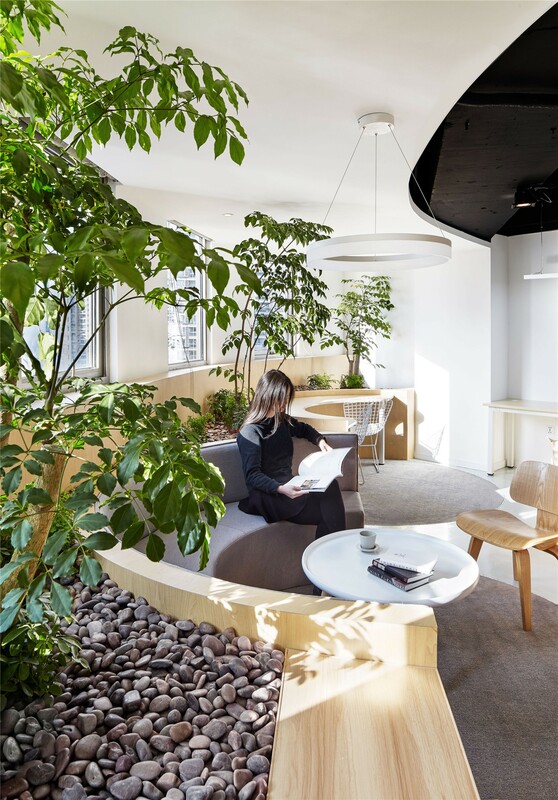 The clients were the first to request a place where staff could "breathe in a little nature". This is why Muxin’s designers decided to eliminate the cubicles and redesign desks, shelves and corridors with gentle, curved lines. They also opened the office to the forest, positioning trees in what is now a large, luminous open space. Like every office, Muxin’s has different areas for meetings, workspaces, silent work areas and areas for talks and conversations. The improvements also include a little communal garden that links the inside and the outside of the building.